Brand new arrival. 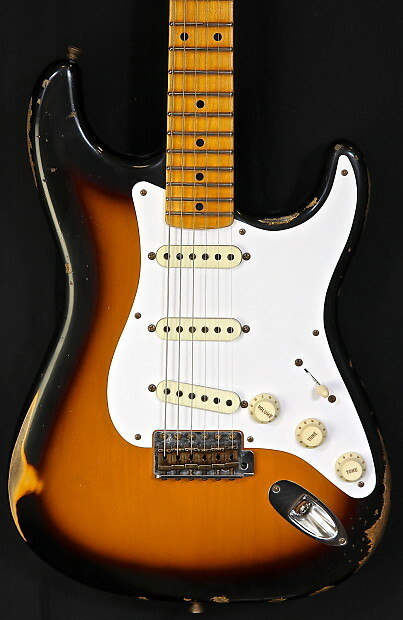 A Fender Masterbuilt 1957 Reissue Relic Straocaster in 2-Tone Sunburst. This beauty was built by Master Builder Yuri Shishkov. This guitar is solid. A great player, and she weighs in at a lightweight 7.2 Lbs. The finish is extremely accurate. The colors are all right. 2-Tone Sunburst Nitro Lacquer two piece Alder body, (sorted for lightweight), with quarter sawn Maple neck. Built to all vintage spec, with the exception of modern wiring, (5-way switch), a 9.5" radius and 6105 frets so it is more comfortable to play and bend. 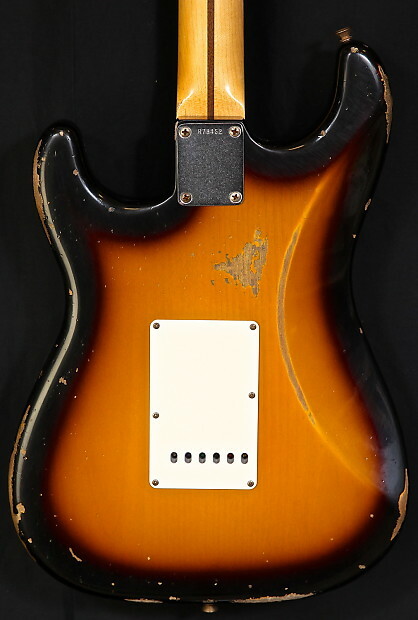 The neck shape is a '57 style soft "V". Bone nut. A stunning piece. Custom shop Fat 50's pickups. Comes with case and all paperwork. Including certificate of authenticity signed by Yuri Shishkov.